Biography: In 1995, Benjiman Bible Ministries began with a vision to visit and serve the fatherless and widows and preach the word of God. They are answering the call on their lives by ministering in 10 remote villages where they fervently preach. Benjiman Bible Ministries is located in Edlapadu with 10 active cell groups. 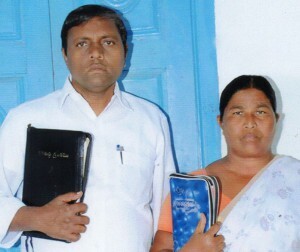 Their church members join Benjiman and Sowbhagyam in visiting door to door and other evangelistic outreaches. They recently distributed 20,000 Gospel tracks and 2,000 New Testament Bibles to the surrounding communities. Strengths: Benjiman and Sowbhagyam describe their strengths to be preaching the gospel, healing the sick and bringing nonbelievers to Christ.